Tonight offers a rare opportunity to hear two related perspectives on the urban housing crisis from authors of new books on this subject: Professor Jessica Trounstine, author of: Segregation by Design: Local Politics and Inequality in American Cities (Cambridge University Press, 2018) and myself, author of Generation Priced Out: Who Gets to Live in the New Urban America (University of California Press, 2018). The event takes place in Bernal Heights at St Kevin’s Catholic Church, 704 Cortland Avenue. You can get tickets here. Segregation by Design draws on more than 100 years of quantitative and qualitative data from thousands of American cities to explore how local governments generate race and class segregation. Trounstine shows how cities have used their power of land use control to determine the location and availability of housing, amenities (such as parks), and negative land uses (such as garbage dumps). The result has been segregation – first within cities and more recently between them. Documenting changing patterns of segregation and their political mechanisms, Trounstine argues that city governments have pursued these policies to enhance the wealth and resources of white property owners at the expense of people of color and the poor. The result is unequal access to fundamental local services – from schools, to safe neighborhoods, to clean water. Generation Priced Out is a call to action on one of the most talked-about issues of our time: how skyrocketing rents and home values are pricing the working and middle classes out of urban America. I tell the powerful stories of tenants, politicians, homeowner groups, developers, and activists in over a dozen cities impacted by the national housing crisis. 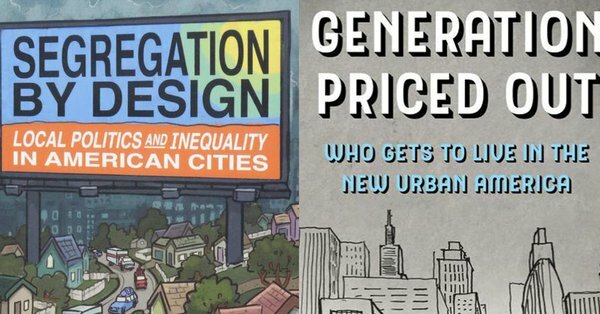 From San Francisco to New York, Seattle to Denver, and Los Angeles to Austin, Generation Priced Out challenges progressive cities to reverse rising economic and racial inequality. My book also exposes how boomer homeowners restrict millennials’ access to housing in big cities, a generational divide that increasingly dominates city politics. I also demonstrate that neighborhood gentrification is not inevitable and present proven measures for cities to preserve and expand their working- and middle-class populations and achieve more equitable and inclusive outcomes. I love the synergy between Jessica Trounstine’s account of the historic racist patterns of urban zoning and my discussion of how cities followed the breakdown of legal racial barriers by erecting obstacles based on class. That’s why single family home zoning still dominates nearly all progressive cities. There will be ample time for discussion following brief presentations by both authors. The event is sponsored by D9 Neighbors for Housing. I strongly recommending attending this event rather than waste your time listening to the pointless, factually-absent State of the Union meanderings of Donald Trump. Randy Shaw is Editor of Beyond Chron.